The Breakfast Club has grown to 5 days/week from February 2019! SUCCESS: "Community Meals" / "Socialised Meals Service"
Excellent progress - Chisholm Institute has agreed to allow the use of Building N (a restaurant, no less) at Chisholm’s Frankston Campus, for a socialised meals service location! A venue means that real planning can now get underway! for those "doing it tough"
If you would like to get involved, please contact any of the volunteer providers. We try to keep this list up-to-date - for additions/updates/errors, please send an email to SHAC3198@gmail.com - thank you. THANK YOU to all volunteers and sponsors! 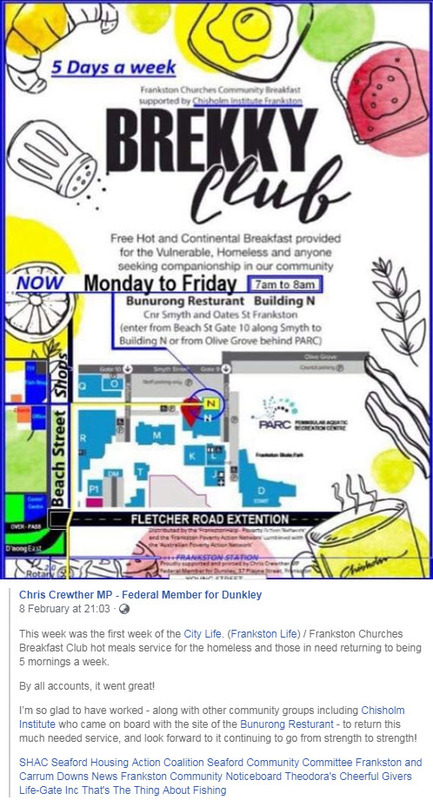 - In the article, Frankston Labor MP Paul Edbrooke is quoted as saying: “The Wintringham kitchen is a resource that was built in consultation with the previous council. It is now available for use immediately should they (Council) decide to use it to feed our most disadvantaged." The ONLY meals available in and around Frankston for the foreseeable future are covered in the above "Community Meals list"
- FCC resigned themselves to these facts, with no mention of the as-yet still unpublished DHHS Report covering "transitioning diners to existing services"
- essentially, FCC accepted the DHHS withdrawal of the "Interim Meals Service"
A meals and social inclusion service that relies on a single provider is a risk if the provider withdraws. 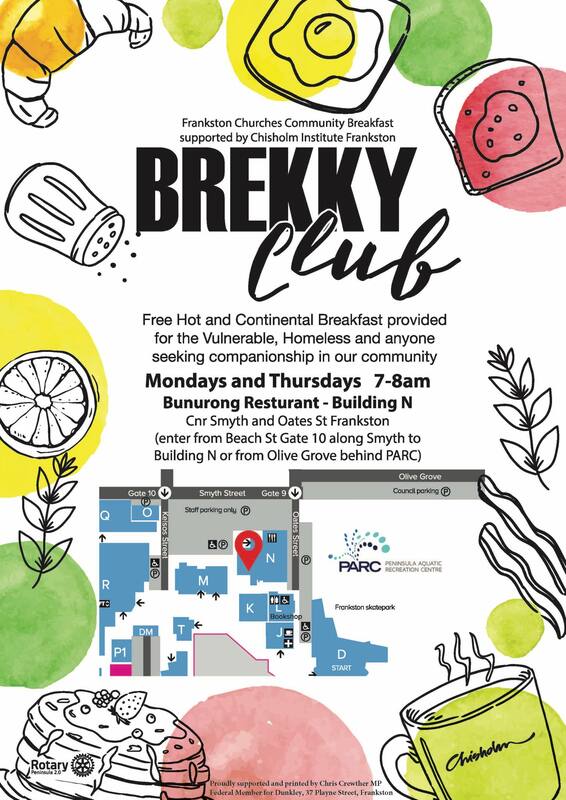 Although there were two providers (City Life and the Frankston Churches Community Breakfast) they operated from the one premise. When the premise was redeveloped and no alternate suitable accommodation found, both services had to close. This risk is mitigated in the current service where 5 different charities are distributing meals at various times. The Frankston community is socio-economically diverse with an enduring legacy of volunteers actively engaged in programs that assist less fortunate residents. As meals services transition new volunteers have come forward to offer support; the newest being Sikh Volunteers Australia. We would be very keen to hear from other charities/organisations that want to get involved. SHAC would also welcome the opportunity of a joint meeting of all 3 levels of government to discuss feasible outcomes. Frankston Standard Leader news article - 26 June, Page 5 - Thank you to Trevor, Kiel and Richard. The closure of these sessions is very disappointing and stressful for all concerned. We had hoped that compassion and logic would see the funding continue. Outcome: Withdrawal of funding and reduced services. Their incomplete list contains no new services – and none of these is funded by government. Although the cancelled sessions were only ever meant to be an interim solution until Wintringham could fill the gap or City Life was able to resume, it has become increasingly evident that an ongoing service of this nature is essential – and not only in Frankston. Over the 12 months that these weekly sessions have been hosted by SHAC, approximately 70-90 different people have attended, of whom 9 or 10 were homeless and/or living in cars. give some idea as to why SHAC and other volunteers want to see the sessions continue. Last bumped by Noel Tudball on Sun Sep 24, 2017 2:36 pm.